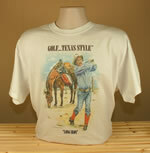 Western art, photography and limited editions prints, including the popular "Golf...Texas Style" series, based on true to life drawings of a cowboy and his companion playing golf. Tom’s giclees are printed on the finest materials available watercolor paper or canvas.The quality of the giclee print rivals traditional silver-halide and gelatin printing processes and is commonly found in museums, art galleries, and photographic galleries. Images are generated from high resolution digital scans and printed with archival quality inks onto various substrates including canvas, fine art, and photo-base paper. The giclee printing process provides better color accuracy than other means of reproduction. See all Greenwood Art Studio's Texas Gifts & Texas Art and buy a truckload! And tell Tom that Truly Texan sent you!